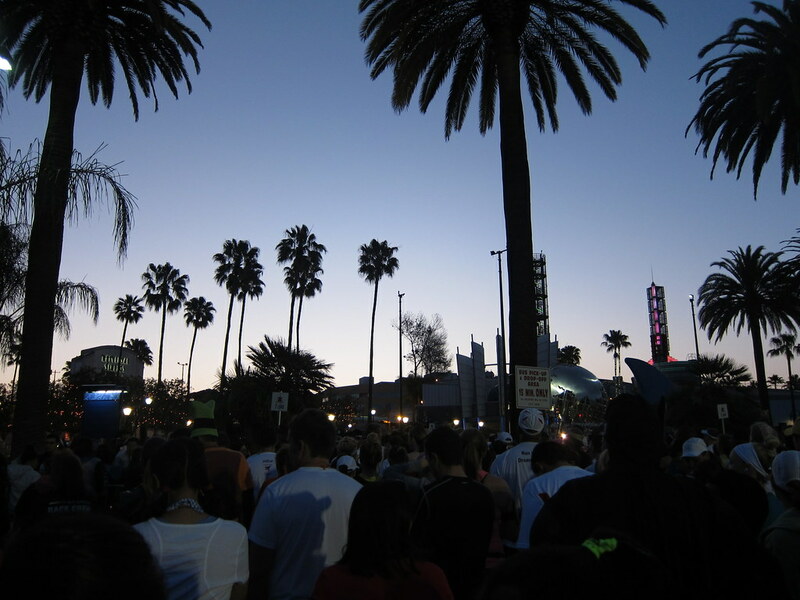 The Green Girl kicked off her birthday weekend by running the inaugural Hollywood Half Marathon. 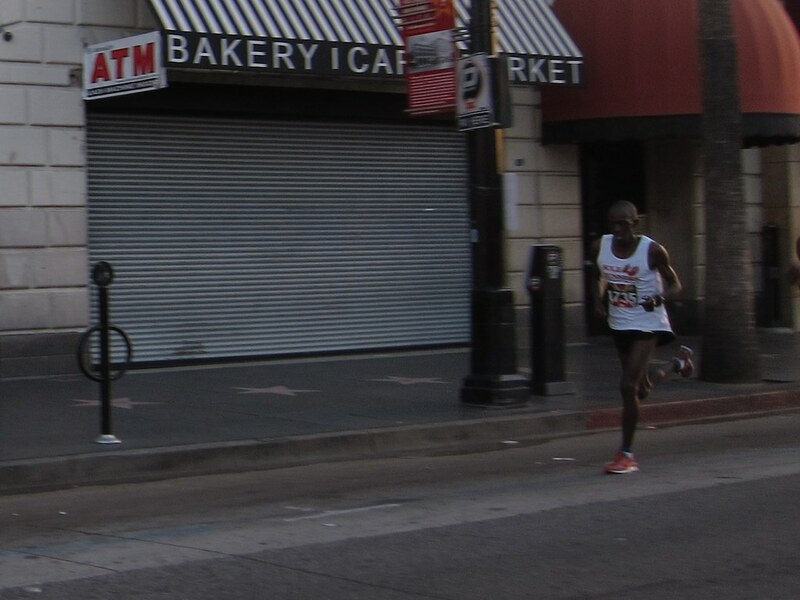 Five dollars from every race registration benefited the Los Angeles Youth Network, an organization that reaches out to homeless youth, and Beyond the Bell Branch, a Los Angeles Unified School District after school enrichment program. 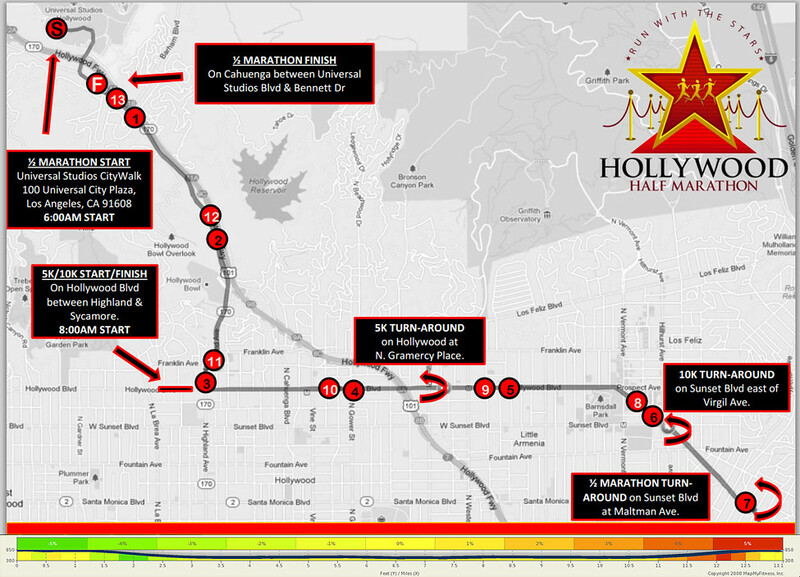 The course started at the Universal Studios Hollywood Globe, went downhill on Cahuenga for two miles, looped east and then back west on Hollywood Boulevard, and ended with two reciprocal hilly miles. 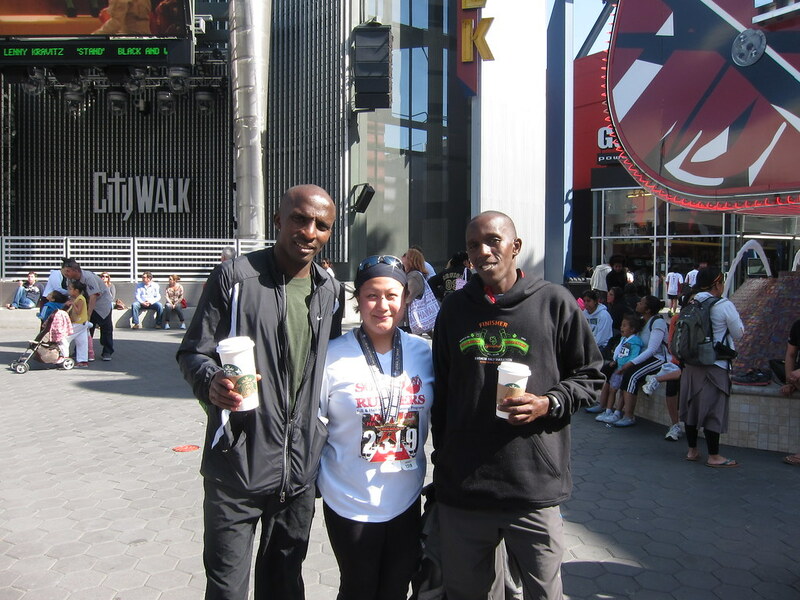 This was the first event I was participating in with Moses Waweru since we met at the 13.1 Chicago Half Marathon last year. Moses's best friend, Benson Cheruiyot, was part of the half marathon elite field. 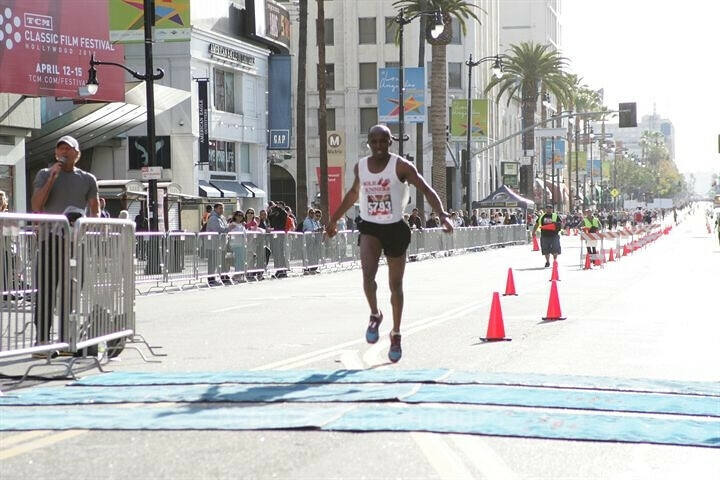 Moses competed in the Hollywood 5k race. We had anticipated race traffic and congestion at Universal City Walk but parking was a non-issue and signs clearly marked the path to the starting area. 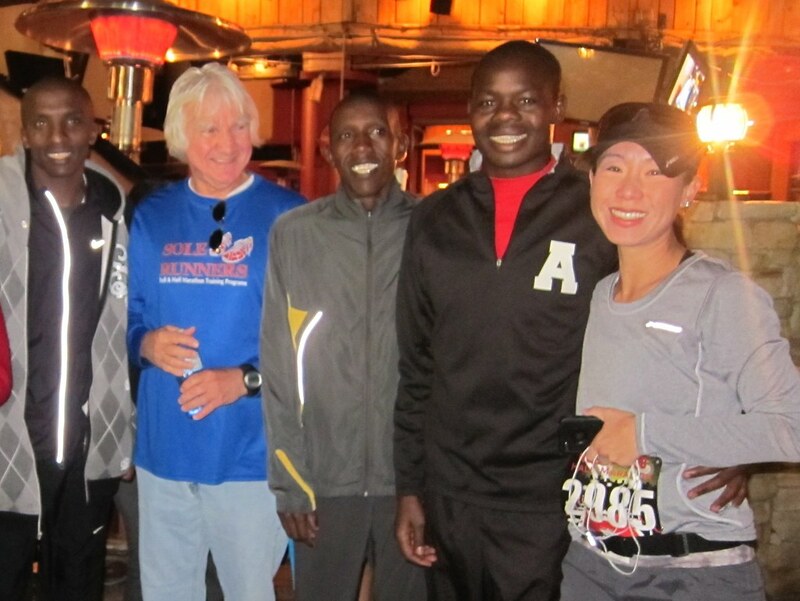 The morning air was cold so we quickly joined the shivering runners huddled around heat lamps along the Saddle Ranch Chop House patio while we waited for the race to begin. 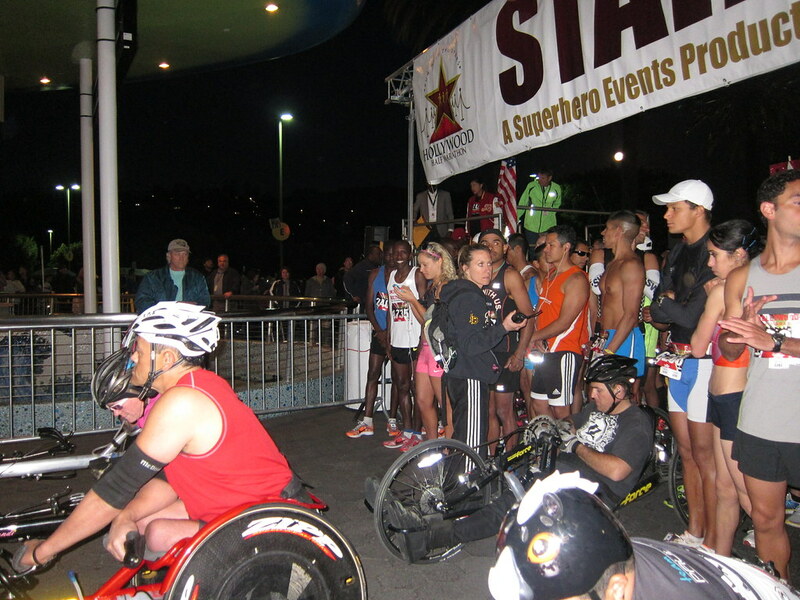 Before the race start, Moses and I managed to squeeze our way up to the front to cheer on the elite wheelchair racers and runners. After cheering loudly for Benson at the elite start, I quickly headed over to the porta-potties before I attempted to seed myself in the 11 minute per mile pace corral. As soon as we crossed the Starting Line, the course went downhill so the race started off quickly. The route was clearly marked with orange cones and well-staffed with volunteers along the way. I focused on engaging my core and taking small, frequent steps on the ascent to minimize the impact on my legs. Around Mile 3, I spotted the lead car. I was ecstatic when I saw Benson was in the lead with MacDonald Ondara on his heel. After stopping to snap pictures and scream my support for Benson, I continued running. By this time, the weather had warmed up significantly but unfortunately, the aid station cup supplies had run out. The volunteers made the best of a difficult situation and cheerfully offered to pour water into runner hands and even gave runners the gallon jugs when they were almost empty. I was grateful for my hydration belt and I made an effort to increase my electrolyte intake when I noticed my fingers were starting to swell. Despite the fact that the 5/10k course converged with the half marathon route, I missed seeing Moses run the 5k but I was grateful that my friend, Janey, was there to cheer him on. Somewhere between Mile 9 and 10, my right hamstring started hurting so I stopped to walk for a bit until the cramping ceased and then I continued running. I powered up the last hilly miles and crossed the Finish Line in 2:40:06. When I checked my text messages, I discovered Benson had come in second (MacDonald had surged at the last minute) in the half marathon and Moses had won the 5k. It was the perfect way to start off my birthday weekend. Yay! Congrats to your hunny & I'm glad you had a great birthday! So cool to rub shoulders with celebrities, especially in Hollywood and on your birthday weekend! What a wonderful birthday weekend! All the best for this new year! That sounds like a wonderful birthday weekend! Congrats to all 3 of you on great runs! What a perfect way to kick off your birthday weekend! Glad you had fun. BTW, the travel stick is visiting Cleveland this week :-). Nice run Green Girl and congratulations to Moses and Benson! It sounds like you had a great time even with the shortage of cups. 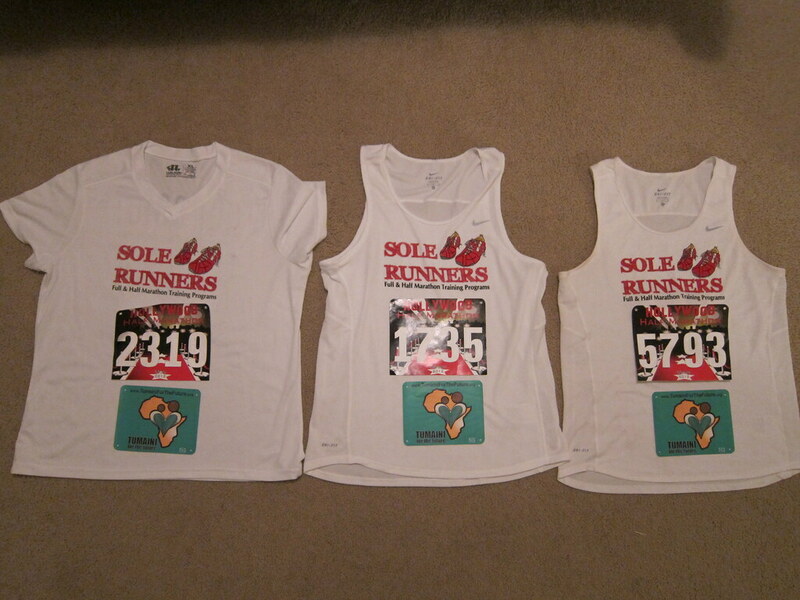 You know some serious elite runners. I love it!